Let me preface this by saying that this is not the type of book that I would normally pick up. Had this been promoted by a non-Christian publishing company, I would not have considered it. However, the premise sounded fairly intriguing and I wanted to dip my toes into something outside my comfort level. With that being said, “Shadows of Hope” just didn’t really get off the ground with me. The drama, while expected given the subject matter, was in my opinion overdone, and the characters didn’t resonate much with me. The narrative is divided between Marissa—whose viewpoint is related in the first person—her husband, Colin, and Kaitlyn, the “other woman”. I found it difficult at times to sympathize with Marissa because of her self-centered attitude toward her marriage and her sometimes unrealistic expectations overall. Colin didn’t seem to have many redeeming features, while Kaitlyn is portrayed as an angelic figure. The way that these three interact throughout the novel does add a definite human interest aspect, but the plot seemed too drawn out. The faith element was present, but almost as a side note, or so it seemed for much of the story’s duration. Granted, there was no profanity or sexual situations—this was a clean read—but faith was not as prominent an issue as I was expecting and hoping for. This was hard to reconcile with my expectations. I also anticipated more suspense and was surprised when so much of the story’s backbone was revealed relatively early on. Nevertheless, I did want to find out exactly how things turned out in the end for each character. 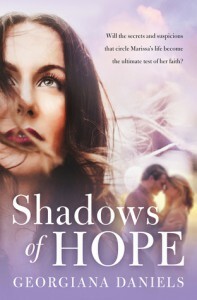 Despite not being the most compelling novel I’ve ever read, “Shadows of Hope” does offer a look at redemption and at facing life’s challenges and heartbreaks.